Pamper her with this gift of Tiar Rose spa products. Body Soap, Hand Soap, Body Butter, Sea Salt and Sugar Body Scrub, soothing Lip Balm enriched with shea butter, cocoa butter, virgin olive oil and essential oils of rose. 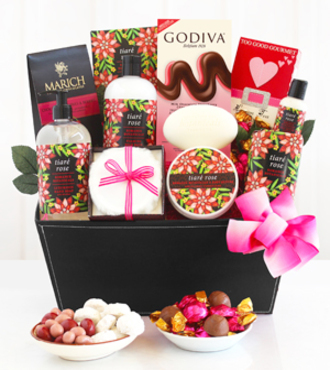 While she is luxuriating in her bath you can feed her Godiva chocolate truffles and Marich chocolate covered cherries. It doesn't get more romantic than this.